Book Your Room Early & Save! For the 2019 NPA Convention & Expo, you have the option reserve your room at either Loews Sapphire Falls Resort or Universal's Aventura Hotel using the same web link and phone number below. Book early before rooms sell out! Call 1-888-464-3617 and mention the National Parking Association to receive the NPA rate. Important: NPA has learned of a scam where a person will call or email conference attendees and exhibitors claiming that they are contacting you on behalf of the organization running the show. Please note, NPA has not authorized any agency to book hotel rooms on its behalf. If you receive a similar solicitiaton be aware this is fraudulent. DO NOT PROVIDE YOUR CREDIT CARD OR OTHER PAYMENT DETAILS and email NPA immediately with details so we may take appropriate action. The only way to book a room with NPA is through the link or phone number above. Loews Sapphire Falls Resort at Universal Orlando™, is the newest on-site hotel at Universal and transports guests to a paradise in the heart of the tropics. Blue waterfalls cascade across lush grounds, and in the distance, the calming sounds of steel drums call guests to take in the scenic water views, ease into ‘island time’, and let go. 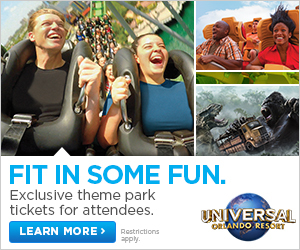 Guests staying at this on-site hotel enjoy exclusive theme park benefits at Universal Orlando Resort™ that you can't get staying anywhere else. Loews Sapphire Falls Resort offers an island escape in the heart of an unforgettable adventure.